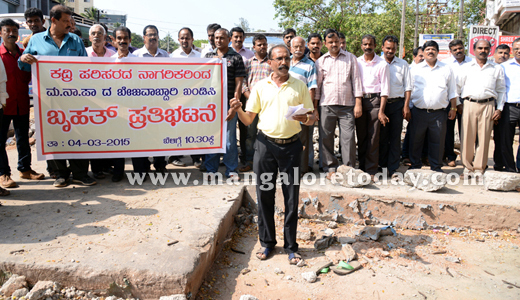 Mangaluru, Mar 05, 2015: Addressing the protestors, Gerard Towers of Nagarika Hita Vedike said half of road in front of Kadri Petrol pump has been dug up for concreting by MCC, from Kadri to Nanthoor. As the marking was done incorrectly, the road has been left as it is over the last 12 days, which has caused and continues to cause great inconvenience to pedestrians and vehicle users. No work has been carried out in this area. 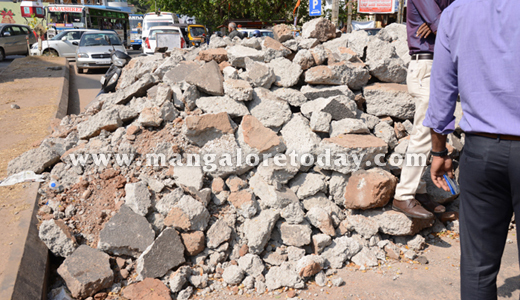 Concrete, gravel stones and equipment have been left on the middle of the road making moving about most dangerous. 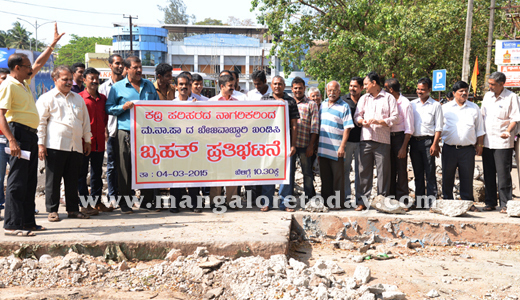 Opposing irregularity in the road works at Mallikatta in Kadri, residents staged a protest and alleged that negligent attitude of Mangalore City Corporation authorities, has created nuisance for the public and endangers safety to all. A stretch of around 10 metre of road has been dug up. Vehicles coming from Mallikatta, have to move on one side, a narrow stretch of a part of the road cause for grave risk to public. Even after three lives have been claimed at a tragic road accident in Nanthoor last week aloneand many in recent time, MCC authorities not seemed to care it is said. Towers said irregularity in the road work has caused great harassment to the residents and especially senior citizens and schoolchildren. Local Corporator Ashok had visited the place earlier and spoken to the authorities concerned, but there was no response, he alleged. Further, signage or boards of warning or containing details of work has been displayed at the place, even though rules lay down that details of work, including contact number of contractor has to be displayed at the place of work, for public. A complaint has been submitted to MCC commissioner on March 4 after a protest it is informed. A resident Arun Shivabhag said after submission of the complaint, MCC officials have marked the other side of the road for concretisation, saying previous marking was wrong. He said paths leading to a nearby apartments are now completely blocked. The responsible people are not reachable and no remedy is underway..